Cauliflower is a cruciferous vegetable. It’s in the same family as broccoli, kale, cabbage and brussel sprouts. It has a compact head which is called a “curd”. When broken apart into separate buds, cauliflower looks like a little tree. Surrounding the curd are ribbed, coarse green leaves that protect it from sunlight which stops the cauliflower from developing chlorophyll. Chlorophyll is the compound that makes vegetables turn green. While this process contributes to the white colouring of most of the varieties, cauliflower can also be found in light green and purple colours. Cauliflower can be traced as far back as 600 B.C. in the Mediterranean region. It is a popular vegetable in Turkish and Italian cuisine. Cauliflower contains compounds that may help prevent cancer. These compounds appear to stop enzymes from activating cancer-causing agents in the body, and they increase the activity of the good enzymes that immobilize and eliminate carcinogens. Sulfur-containing phytonutrients such as sulforaphane and isothiocyanate increase the liver’s ability to filter and neutralize potentially toxic substances. There are many other enzymes such as glutathione transferase and quinine reductase that help the detoxifying process for the liver that helps to decrease the risk for certain cancers. Include cauliflower in your diet for its detoxifying benefits. 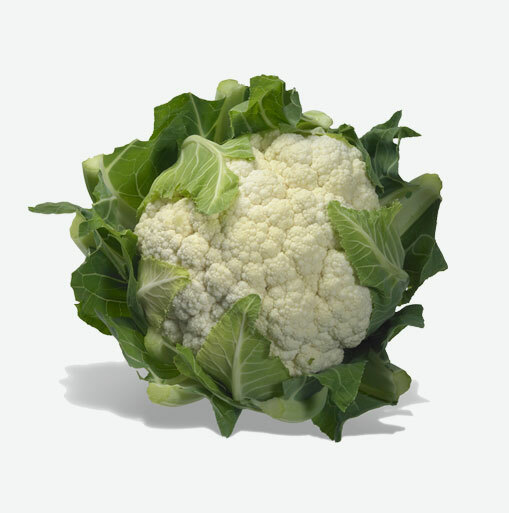 Look for cauliflower that is clean, creamy white, has a compact curd in which the bud clusters are not separated. Avoid spotted or dull-coloured cauliflower or cauliflower that is bruised. Heads that are surrounded by many thick green leaves are better protected and will be fresher. Remember, size is not related to its quality, choose one that best suits your needs. You can store uncooked cauliflower in a paper or plastic bag in the refrigerator where it will keep for up to a week. To prevent moisture from developing in the floret clusters, store it with the stem side down and add a sheet of paper towel inside the bag. Cauliflower florets are the part of the plant that most people eat. However, the stem and leaves are edible too and are especially good for adding to soup stocks. To cut cauliflower, first remove the outer leaves and then slice the florets at the base where they meet the stalks. Trim any brown spots that may exist on the edges. Since cauliflower contains phytonutrients that release odorous sulfur compounds when heated, keep in mind that these odours become stronger with increased cooking time. If you want to minimize odour, retain the vegetable’s crisp texture, and reduce nutrient loss, cook the cauliflower for only a short time. Avoid cooking cauliflower in iron cookware. Use glass or stainless steel. This prevents the cauliflower from turning a brownish colour. Sauté cauliflower with garlic, rosemary and olive oil. Puree cooked cauliflower and about one cup of mashed potato. Add caramelized onions, a cup of rice milk or soy milk and some sea salt. Serve up as a soup. Cauliflower florets makes a great dipping vegetable with your favourite dip.